Spotify is probably how most Americans were introduced to streaming music over the last four years or so -- the service has grown by leaps and bounds since it launched in the US in July of 2011. But a relatively small group of music fans were enjoying pretty much all that Spotify had to offer months before it hit the US. That group was using Rdio, and we'll now have to find a new option: Rdio will be dead soon, sold off to Pandora in a bankruptcy deal. The service will remain a cautionary tale about the brutality of survival in the streaming music world. A great product is important, but it's clearly not enough. It's easy to forget that for a long time, Rdio was a truly great product for music lovers. I was a paying customer from late 2011 until earlier this year, when myriad bugs finally convinced me to seriously explore other services. When I first signed up, there was one simple reason I chose it over Spotify: app design. Spotify is better these days, but for a long time its desktop and mobile apps were a confusing mishmash of features with no centralized music collection. Rdio, on the other hand, let me easily save albums and browse them in an iTunes-esque fashion. I love being able to browse my collection of albums and wasn't ready to save everything in playlists. Rdio's minimalist design is still a breath of fresh air. The collection feature (still a bizarre omission that took Spotify years to fix) was far from the only good part of the Rdio experience. The service's social features, something that's become table stakes for streaming music, were strong without being overbearing. You could always see what people you followed were listening to in a right-hand pane, and the "heavy rotation" feature was a good aggregation of the albums that were bubbling up in your network. I never really cared what music was trending among people I've never met. Instead, Rdio was smart enough to show me what was trending among the people I cared about. At the end of the day, its apps simply were much nicer to look at easier to understand. Even now that I know basically all the streaming services inside and out, I'm struck just by how minimalist Rdio is -- the simple apps still manage to contain a bevy of features in a logical way. Over the last few years, though, cracks have appeared in the foundation. The last big visual update Rdio released just over two years ago was its best yet, and the company steadily added more and more smart features since then, but the company clearly went through internal turmoil in 2013. CEO Drew Larner announced plans to step down halfway through that year (he was eventually replaced by former Amazon executive Anthony Bay) and the company laid off about a third of its workforce that fall. It started a cycle that Rdio was never able to recover from, despite the product's strength. As Casey Newton reports at The Verge, the company never had a marketing chief for more than a few months at a time. One anonymous employee is quoted as saying that "no one was looking over marketing whatsoever." That lack of ambition and organization to grow the product's awareness appears to have been a major contributor to Rdio's eventual failure -- that and the fact that it was going up against Spotify's potent combo of huge war chest of funds coupled with a free, ad-supported tier. Rdio's deal with terrestrial radio giant Cumulus in 2013 let it finally start offering ad-supported music, but by then Spotify had sprinted to number one, far ahead of the competition. 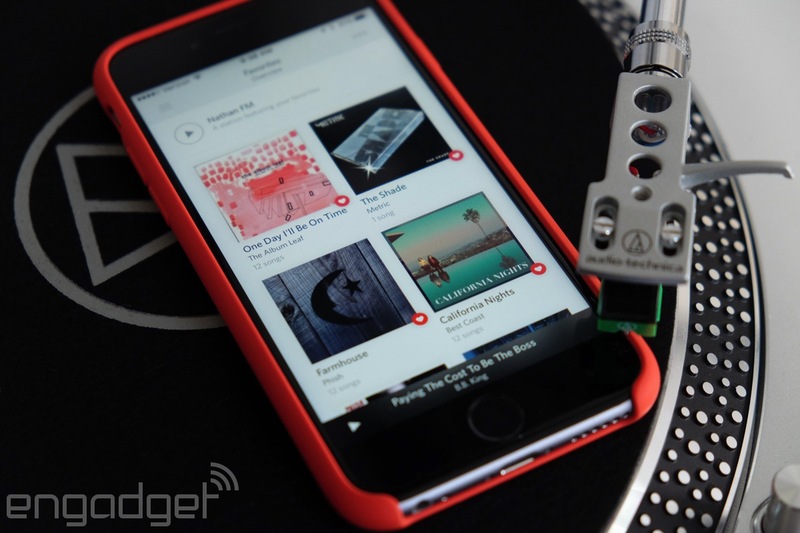 Ultimately, Rdio's failure shows just how ruthless the streaming music market is. A new report today shows just how much trouble Rdio was in, owing millions of dollars to Sony, Roku and Shazam while losing around $2 million every month. Giants like Apple and Google can afford to subsidize the expenses of streaming music, while Spotify's approach has been to build a war chest. The company has raised $1 billion in funding to help it survive while it tries to convert more users to its paid service and make the business sustainable long-term. There's basically no room for a start-up in this space anymore -- Mog was bought by Beats which was bought by Apple, Rdio is folding, and the jury is out on Tidal despite the backing of huge superstars. It's not a stretch to imagine smaller players like Deezer meeting Rdio's eventual fate. Having lots of money matters more than having great design. In fact, it's entirely possible that those who survive the streaming music wars will do so because they diversify beyond just music. Spotify is jumping into podcasts and video this year, while Pandora's purchase of Ticketfly showed a desire to engage with music fans outside the confines of its app (the company is also streaming the second season of hit podcast Serial). Most of the recent innovations coming out of Rdio focused around its curated radio station features, something it was late to adding after Spotify and Pandora. That's not to mention Vdio, the company's brief foray into streaming video that was dead on arrival. While some of Rdio's DNA will undoubtedly live on in Pandora's enhanced service when it launches late next year, the whole market will be poorer for Rdio's passing. It's been a few months since I spent much time using Rdio, but this week's news made me jump back in. I was shocked at how simple but powerful the service remains, particularly when compared to the bloated mess that is Spotify. Rdio not being around to push its competitors into better design is a real shame; indeed, Rdio's design made its way to plenty of apps across many categories, not just music. The company was one of the first to make hidden left-side navigation menus a major part of its UI, something you'll see across scores of apps now, and the translucent gradients in its apps are all over the current iOS design. Minimizing the "now playing" screen down to a slice at the bottom of the screen is a trick basically every music app uses now. I won't miss the bugs that eventually forced me away from Rdio, but I will miss the first streaming music service that was good enough to earn my cash.